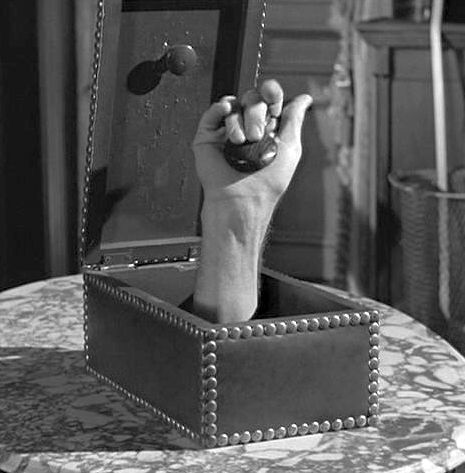 I have long had a fascination with disembodied hands. They have always delighted me, but creeped me out at the same time. Many other disembodied hands have been covered on my blog such as Hand Soap, Baby Soap Hands, Spooky Wall Hands and Hand Hooks. I have one room in my house that is reserved for my hand fascination and all of my disembodied hands are sent there. I must admit it is a very creepy room, but it makes me happy. I often find my hands in antique and junk stores, but once in a while I find them brand new like this Buddhist Hand from Z Gallerie. They often surprise me with some of their offerings. My only problem would be the price. I’m not sure I want to spend $99.95 on a hand, when I already have two attached to my body and a room full of them. Maybe I’ll get lucky and find it at some garage sale in a few years when the sucker that bought it has decided it’s not hip anymore. Come to think of it, I’m not sure how this love of hands came to be. Maybe it’s the whole obsession I had with Thing from the Addams Family when I was a kid. I still want a live one, so I buy things like this Buddhist Hand hoping that all of the disembodied hands in my house will eventually pull a Toy Story and come to life. I can dream can’t I?